Redesigned! Now with a solid 1-piece gasket and higher drain hole to prevent the possibility of leaking. Carry strap is now INCLUDED! The Coyote Portable Camp Toilet System is the perfect cleanable camp toilet, or "groover", for multi-day trips on or off the river. Designed and tested in our own shop.... well, not tested IN the shop, but well-tested. 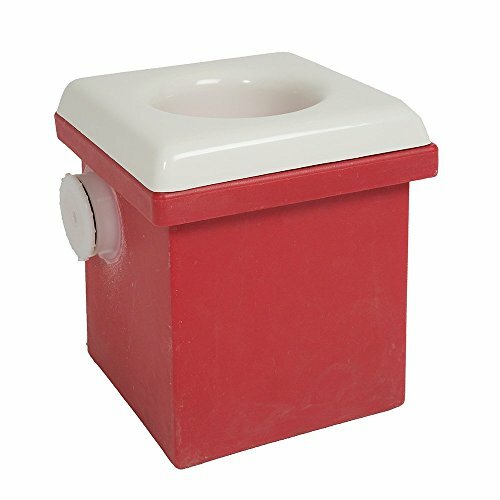 A large opening and fitted seat make the Coyote Toilet System one of the easiest to use and cleanest portable toilets on the market. Light weight (when empty of course) with a comfortable fitted seat and more user days than other popular camping toilets, pottys, commodes or latrines. The Coyote Portable Toilet System is the best choice for long trips away from the comforts of your home bathroom. The Coyote Toilet's polyethylene box won't soak in odors and the gasketed lid seals tightly to keep those odors at bay while strapped into your raft, cataraft, canoe or vehicle. The compact size makes it easy to rig in most boats, trucks or RVs and the wide base makes for a very stable area of operations, even on semi-uneven ground. A 3 inch drain plug and 3/4 inch hose fitting are welded into the box, making it easy to self-clean at the nearest RV dump station with the included flush-out fittings, hose and plugs. The Coyote Portable Toilet System meets all BLM, NPS and USFS regulations and will qualify for any permitted river trip, including the Grand Canyon. If you have any questions about this product by Coyote River Gear, contact us by completing and submitting the form below. If you are looking for a specif part number, please include it with your message.